Breadsmith: What Is New in the Bakery? What Is New in the Bakery? Starting today, for a very limited time, look for Hot Cross Buns in the bakery. Available individually, as a loaf or in a tray of mini's (9 per tray). 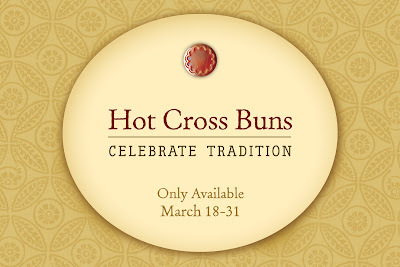 Hot Cross Buns are only available until the end of the month. These tasty treats are traditionally made during this early Spring season. Ingredients include raisins, honey, orange juice and peel, cinnamon and vanilla. Yum!